• Washer fluid ● Have a service technician inspect the level and specific gravity of battery electrolyte. ● Have the vehicle fitted with four snow tires or purchase a set of tire chains for the rear tires. Perform the following according to the driving conditions. ● Do not try to forcibly open a window, scrape an outside rear view mirror surface or move a wiper or outside rear view mirror that is frozen. Pour warm water over the frozen area to melt the ice. Wipe away the water immediately to prevent it from freezing. Park the vehicle and move the shift lever to P (automatic transmission) or 1 or R (manual transmission) without setting the parking brake. The parking brake may freeze up, preventing it from being released. If necessary, block the wheels to prevent inadvertent sliding or creeping. ● Regulations regarding the use of tire chains vary according to location and type of road. Always check local regulations before installing chains. ● Install the chains on the rear tires. ● Retighten the chains after driving 1/4 - 1/2 mile (0.5 - 1.0 km). ●Install tire chains on the rear tires only. Do not install tire chains on the front tires. 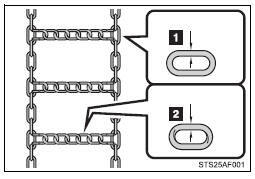 ●Install tire chains following the instructions provided in the accompanying instructions. ●Use tires of the size specified for your vehicle. ●Do not drive in excess of 75 mph (120 km/h) regardless of the type of snow tires being used. ●Snow tires should be installed on all wheels. ●4WD models: Do not mix tires of different makes, models, tread patterns or treadwear. ●Do not drive in excess of the speed limit specified for the tire chains being used or 30 mph (50 km/h), whichever is lower. ●Avoid sudden turns and braking. Always use wheel blocks when parking without the parking brake. Failure to do so may allow the vehicle to move, resulting in an accident.